Now that I've traveled the Amtrak California Zephyr line from Iowa to California about sixteen times (eight round trips), I've met other bicyclers on the train. Chatting with them are some of my most pleasant encounters. Some "encounters" have been fleeting--more bicycle "sightings." One was of a man in his twenties with his biking helmet and panniers who snoozed on the train for a few hours, from Reno to Sacramento. Another encounter was descending to the lower level where restrooms and carry-on baggage are situated, and then seeing a soft-bagged bicycle leaning in the aisle. Later I met the owner who said he was traveling with a racing bike, which must have had S & S couplers so it could break down. I had a great talk once with a conductor who said he had a folding bike and would take it on the train so that he could ride along the lake when his work run ended in Chicago. He was supportive of having more bicycles on Amtrak. He also mentioned that one place to tuck my folding Montague Navigator, if the carry-on baggage area was full, was in the lower level seating area behind the last seat. My most fun talk was on my last trip home. I met a biker from Colorado who was taking his bike to the Erie Canal to ride that bike trail. Ivan had ridden the C & O Canal Trail last year and was now on his way for a fall ride on the Erie. I spotted him because his overhead bags were red Ortlieb panniers. I never saw his bike, so I assume he had it boxed and on the baggage car. He was interested in the folding bike option that my Montague provides. He was on his way a week later than he had originally intended, so we talked temperatures and weather. We also talked about the canal pathways and his experience on the C & O. With many campgrounds and food and lodging options, the canal routes sound like an interesting option and a trip my wife and I might someday take. We also talked Midwest trails, and I gave him what info I could about the Katy Trail and the Mississippi River Trail. Ivan was interested in the quality of the Midwest trails, and we discussed lime chip surfaces. He said he had almost chosen the Katy Trail for this fall's ride. I wish him tailwinds and fair skies on his trip. 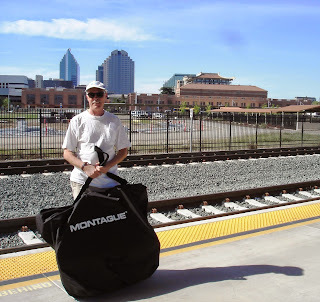 Meeting like-minded bicycle travelers on Amtrak is an experience that I hope increases with time.